Recently, Microsoft removed a few older DLLs that are used by DT Trainer. If a Visual C++ DLL dependent reinforcer doesn’t play (if you’re not sure if they are playing, please click on the “Test Reinforcers” link located below), right click your DT Trainer Administration icon that is located on your desktop and select “Run as administrator.” Now select the “Common Administration” tab located at the top of the window. Click the “Maintenance Tools” button. You should now see the DT Trainer Maintenance window. Select the “Show All (includes packages already on your computer)” option. This will contact the DT Trainer server and show the updates that are available. Click on the “plus” next to the “Custom” listing and it will expand to show two selections. Click next to the “MS Visual C++ 7.1 Drivers” selection. 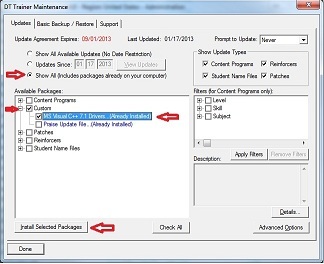 Now click on the “Install Selected Packages” and it will download and repair your installation.